similar to the search for the perfect pair of jeans, the search for the perfect pair of denim shorts can be just as daunting. especially if you’re on the taller side and in your early 30’s and don’t feel comfy exposing large portions of your upper thigh for the world to see. for those reasons i’ve literally held onto a pair of blue and white denim shorts i got from j.crew factory upwards of six to seven years ago (even tailoring them in the waist when they stretched out from frequent wear) until i could find viable replacements. but after falling in love with abercrombie’s mom jeans, i’ve taken note of other types of denim the brand offers. sure enough, i stumbled upon their high-rise mid-length denim short, which comes in a variety of colors, washes, and levels of distressing. after noticing them on some of my fellow style bloggers, and waiting for them to go on sale, of course, i ordered them in the medium wash and white in both my regular size (26) and one size up (27). i figured if my regular size was too short for my liking, i could choose to wear the larger size more on my hips to add length. speaking of fit… let’s break it down! 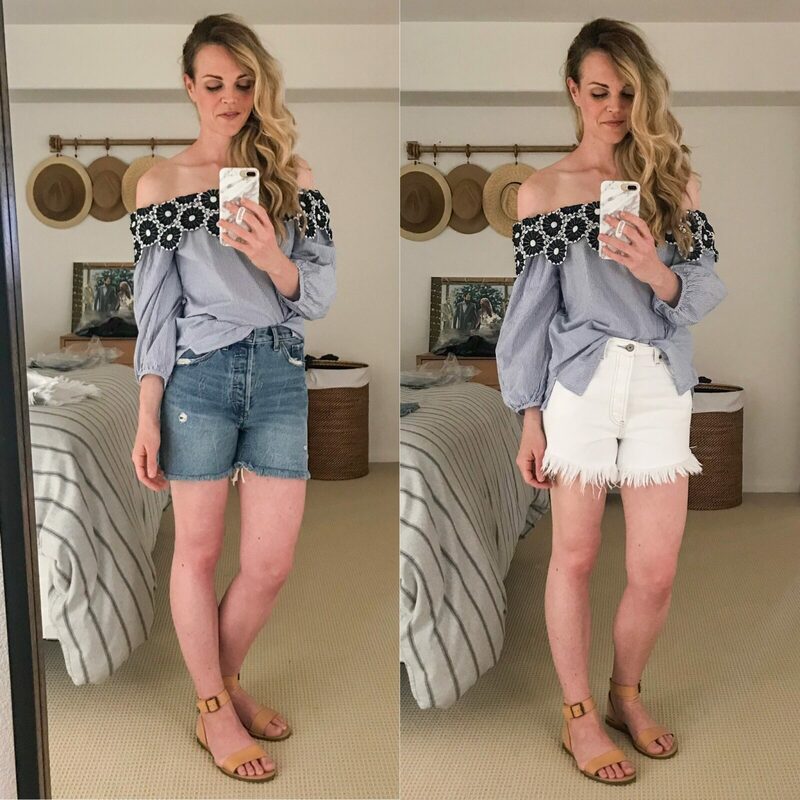 though they are both characterized as ‘high-rise mid-length denim shorts,’ there are a few distinguishing qualities between the mid-blue and white washes. 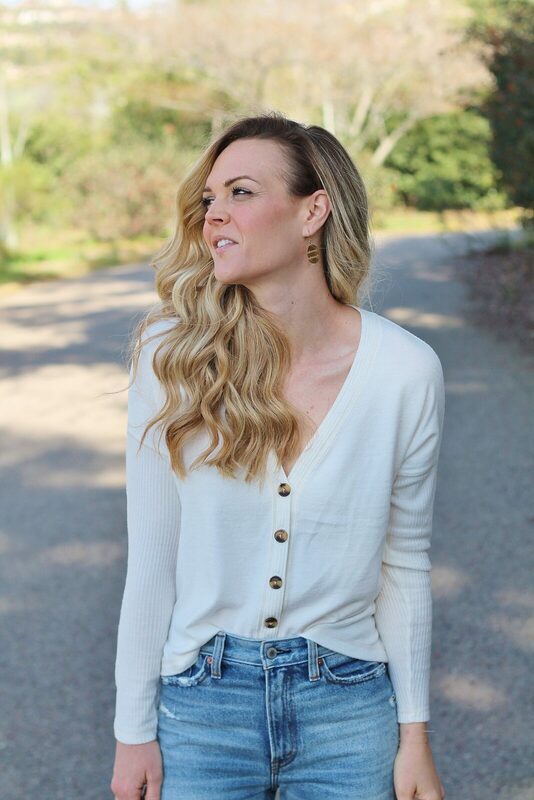 let’s start with the traditional denim -i chose the less distressed version (similar to the wash of my mom jeans) since i felt it was a bit more classic for everyday wear. though they boast a raw hem, it still feels finished (if that makes sense), meaning i won’t be nervous to wash them and have the ends fray like crazy as what i would imagine would happen if i had made them myself by cutting off an old pair of levi’s. a small detail that my husband actually noticed first is a tiny ‘v’ cut up into the side hem of each pant leg. it’s a flirty detail that, again, makes them feel expensive and well-designed. moving over to the white pair, unlike the subtle fraying of the hem on the blue wash, the white version is quite exaggerated. it almost feels like feathers, but in a cute way. ha. i didn’t notice at the time of purchase, but the stitching detail is more of a taupe color as opposed to matching white. i don’t really mind either way, it was just something that caught me off-guard at first blush. both pairs have the button-fly, angled front pockets, and two back pockets centered on either side. after modeling them in the mirror, i noticed that the hem length on the white pair is slightly gradual, being longer in the front and subtly cutting up on the sides. to be honest, i think i like the style of the white pair more, but i know i will get a ton of wear out of both colors! in terms of the quality, both pairs are made from a rigid denim, which already makes them feel more luxe than a version composed with spandex. i’ve said it once and i’ll say it again, the abercrombie of our youth has been given a big upgrade and we’re all reaping the benefits! i’d put these shorts up against any of their designer equivalents. at $58, they’re a steal for the quality -especially when you consider that nearly identical brands that retail for two and a half times the amount. abercrombie runs sales all the time so if you keep close watch on the website, chances are you could snag them for even LESS during a storewide promotion. if you head on over to my instagram stories, i’m also sharing a complete review of both pairs of shorts. i’ll save the videos under my highlights so you can reference them later, too. as always, please feel free to reach out with any questions!